Chicago Cub Superstar “Slammin” Sammy Sosa hit the most home runs ever in a single month, when he homered, hopped, thumped his chest and blew kisses to family and fans a total of 20 times during June of 1998. 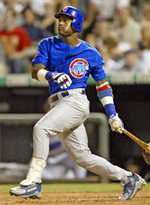 On June 1, “Big Mac” Mark McGwire had 27 home runs, while Sosa had a mere 13 dingers. But soon, “Slammin” Sammy made his move. From June 1-June 30, Sosa belted 20 home runs to set a Major League record, which is also the most homers ever hit in any month. Ken Griffey, Jr. hit his 500th home run vs. Matt Morris of the Cincinnati Reds on June 20, 2004. After hitting number 499, Junior had to wait exactly one week for the fabled No. 500, but the landmark blast couldn't have come on a better day. 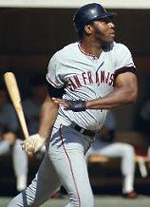 Launching his 500th home run on Father's Day was the perfect way for Junior to end his quest, considering that he and his dad, Ken Griffey Sr., are probably the most famous father/son duo in Major League history. Junior wasted no time making his way to his dad, who was sitting right next to the Reds dugout. "It's been a great Father's Day for me," Griffey Sr. said. "I had my grandkids sitting there watching the game and I enjoyed every minute of it." Editor’s Note: Junior loves June so much that he also blasted out homer #600 during the sixth month of the year - June 10, 2008 to be precise. That was the day Griffey became the sixth player in history to reach 600 homers with a drive off Mark Hendrickson in the first inning of the Cincinnati Reds’ 9-4 victory over the Florida Marlins. Griffey joined Barry Bonds, Hank Aaron, Babe Ruth, Willie Mays and Sammy Sosa as the only players to reach the mark.